The Donations Just Don't Stop! Are you coming to see us on Saturday? Our HandmadeMN Spring Market is this Saturday, May 5, at the Ballentine VFW in Minneapolis. The team is finishing the last minute details so you'll have a great shopping experience. 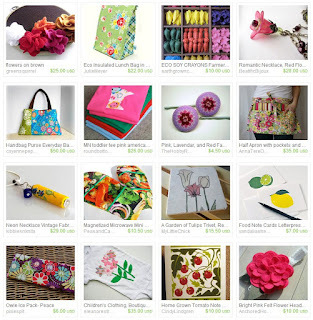 You will have the opportunity to shop for a variety of handmade product from our 45 vendors. 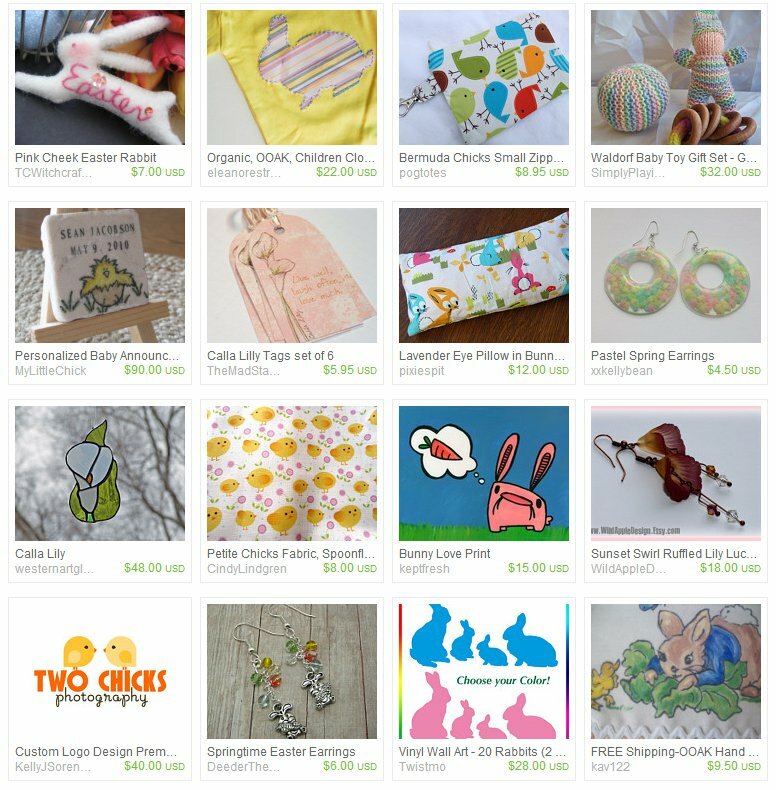 We have jewelry, leather journals, photographs, illustrations, cards, baby clothing and accessories, kitchen decor, home decor, vintage items, woodturned and carved product, purses, totes, wallets, soy crayons, yoga mats, monster pouches, quilts, and so much more. If you're one of our early shoppers you will receive one of 25 Swag Bags (actually there are more than 25 this time!) They will be handed out at both the front and back entrances of the VFW. Everything in the SWAG Bags have been donated by our members and everything is handmade - you won't be disappointed. You'll also be drooling over our Giveaway Baskets! Each is worth at least $150. Just get your passport stamped by 3 vendors on the main floor and 3 vendors in the basement! No purchase necessary! Our past winners have been ecstatic with the basket contents. Here are some items that you will find in our Swag Bags or in our Giveaway Baskets and they will be available at the Market too! KibblesNKnits was very generous with her donations - look at these adorable necklaces and rings! AnnaTereDesigns donated these Phone Charger pouches and also some hair accessories too. You may find these "Love from Minnesota" notecards in your SWAG Bag from VandaliaStreetPress. Look at these lovely pouches from JulieMeyer. EleanorsTreasures makes these delightful appliqued onesies and TShirts. CayennePeppy has a lovely line of jewelery and also makes adorable bags. 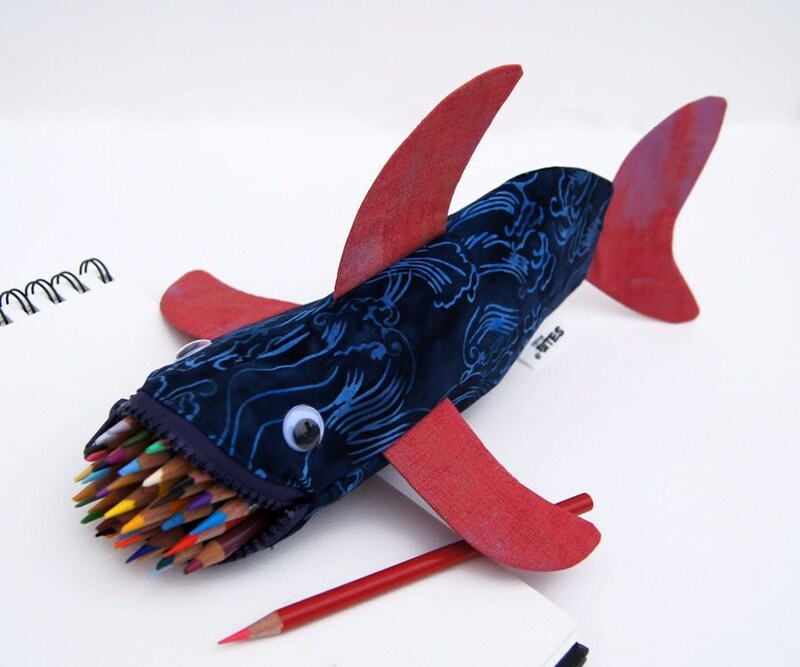 You may find water bottle holders and adorable felt and bottle cap pins from AimeesHomestead. DeederTheBeader has made this lovely set of earrings and necklace for one lucky shopper! ArtyDidact has made pouches and greeting cards for our Giveaway Baskets and Swag Bags! 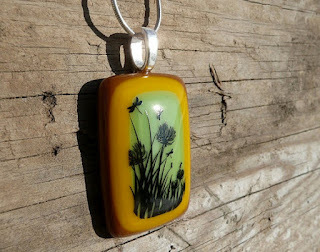 We also have fused glass from DragonflyAdornmants to giveaway! Do you need a travel wrap? If so, then hopefully you will win one from MargaretMousleyDesigns. PixieSpit has donated several of these delightful pony tail holders for our Swag Bags. 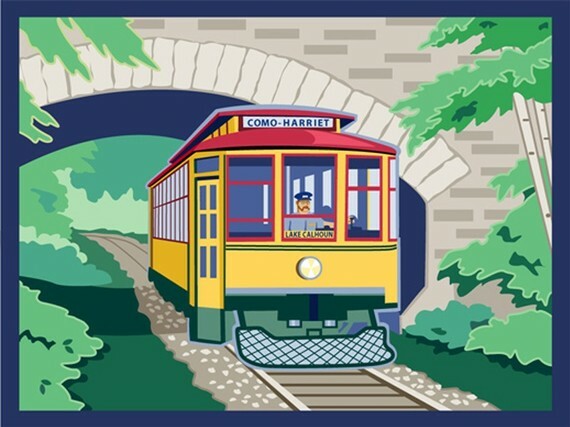 And CindyLindgren has donated both prints and cards! Aren't these absolutely out-of-this-world donations from our team to you, our shoppers! Later this week you will see all of the Swag Bags and the Gift Baskets. You will definitely want to find some time to stop by on Saturday to see us! 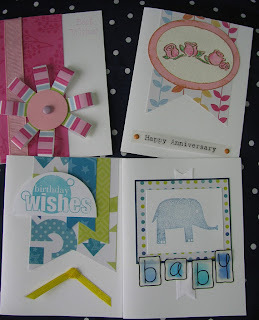 This week's giveaway is from Kristen of Created by Kristen M. She is giving away this fun set of handmade cards. Kristen made this set of nine handmade cards with beautiful papers and adorable embellishments. You will be proud to give these to friends & family! Included in the set is 1 wedding card, 1 anniversary card, 1 sympathy card, 1 graduation card, 1 baby card, 3 birthday card and 1 best wishes card. Click on the photo to see Kristen's listing picturing all 9 cards. Contest ends Saturday, May 12th, at 12:00 noon Central. One winner will be chosen by Random.org. 7. Become a Facebook Fan of Created by Kristen. Comment back here with your Facebook name. Existing fans just leave your Facebook name here. Stop and smell the roses, then come on over to shop some fantastic finds at the HandmadeMN Spring Market, Saturday, May 5th from 10am to 5pm. 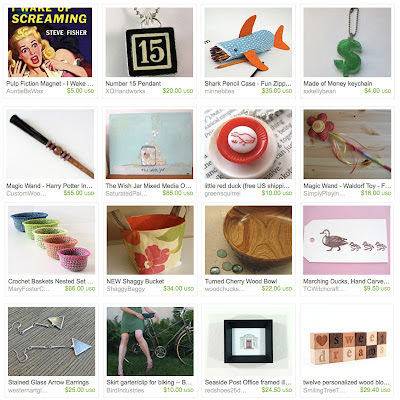 Here's just a sampling of the HandmadeMN Market items you'll find. This week's giveaway is from Monique Parent of Glass Garden Designs and is giving away this colorful Spring Wildflowers and Dragonflies Glass Pendant. A silhouette of playful dragonflies and wildflowers adorn a color-blocked garden of spring green, sunshine yellow, and caramel brown. Multiple firings and hours in the kiln produced this unique necklace. The image is enamel and is scratch resistant and waterproof. This is a nice sized pendant at almost 2" long including the silver bail, and almost 1" wide. Wear it right away with the FREE 18” silver-plated chain that's included! 8. Follow Monique's blog. Leave a comment here letting us know you are a follower. If you are already a follower, leave a comment anyway, as each comment is an entry. 9. Contest ends Saturday, May, 5th, at 12:00 noon Central. One winner will be chosen by Random.org. It's almost here! In a little over two weeks you will be able to partake in our Spring Market. We hope to see you on May 5 at the Ballentine VFW in Minneapolis. Not only will you be able to shop for a variety of handmade product from our 45 vendors, but our early shoppers will also received Swag Bags - at least 25 will be available. They will be handed out at both the front and back entrances of the VFW. They will be filled with jewelry, scarves, purses and pouches, vinyl decals, cards, mini monsters, flowers, wood crafted items, and so much more. You'll be drooling over our Giveaway Baskets too! Each is worth at least $150. Just get your passport stamped by 3 vendors on the main floor and 3 vendors in the basement! No purchase necessary! Our past winners have been ecstatic with the basket contents. Here are some items that you will find in our Swag Bags or in our Giveaway Baskets and they will be available at the Market too! Christy from redshoes26designs donated these beautiful framed artwork of Minnesotan icons for our Press Kits. You will find her illustrated cards in many of the Swag Bags and in the Giveaway Baskets. Like honey? Then you'll be delighted with these beeswax candles and tealights from SweetBeeHoney. You may also find one of these products from BodyBlissOrganics in your bag or basket. You will absolutely fall in love with these earrings from Blackstone Pottery. Looking for necklaces? Then check out WildDogStudio! SuzandRoo has crafted these fun bracelets and ponytail holders. And who doesn't want one of Trigo's furry monsters for their cell phone? And look at the mini Nerd monsters too - one may be lurking in your Swag Bag! WHERE: James Ballentine VFW, 2916 Lyndale Avenue S, Minneapolis, MN 55408.
parking lot located at rear entrance to VFW, on Aldrich Avenue. This week's giveaway is from Kathy of Wonderkath. She is giving away one of these charming hand stamped pendants. 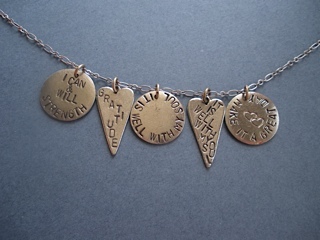 Kathy has hand stamped these fun silver plated pewter metal pendants with inspirational sayings. The circles are 3/4" in diameter, the hearts are 1" in length. The winner will choose one from the 5 options shown: I can & will, strength (circle) ~ gratitude (heart) ~ it is well with my soul (circle or heart) ~ make it a great day (circle). The pendant will come as a ready to wear necklace; including a silver plated chain up to 20" with a 2" extension chain. Contest ends Saturday, April 28th, at 12:00 noon Central. One winner will be chosen by Random.org. 7. Become a Facebook Fan of Wonderkath. Comment back here with your Facebook name. Existing fans just leave your Facebook name here. 8. Follow Wonderkath on Twitter. Comment back here with your Twitter link. Existing followers just leave your Twitter link here. Fun Friday Finds: It's Tax Time! This week's giveaway is from Mary DesCombaz of Pog Totes and is giving away this pretty small make-up bag. Mary created this vibrant handmade makeup bag that features a beautiful bird print, with a hounds tooth print on the inside. The bag is approximately 9.5 inches long by 5.5 inches tall. It is a great way to hold all your essentials for travel or everyday use! 7. Become a Facebook Fan of Pog Totes. Comment back here with your Facebook name. Existing fans just leave your Facebook name here. 8. Contest ends Saturday, April 21st, at 12:00 noon Central. One winner will be chosen by Random.org. HandmadeMN Fun Friday Finds ~ Happy Easter! Have a Good Friday and enjoy your Easter. This month's challenge theme is Sunrise/Sunset. Check out the great entries below, then scroll all the way to the bottom to vote for your favorite! Voting ends at midnight on April 15th. Our Spring Market on May 5 is just around the corner. The venue, the Ballentine VFW in Minneapolis, remains the same as do our hours of 10:00 am to 5:00 pm. And, most importantly, our HandmadeMN members have once again demonstrated their generosity with their donated product for our trademark Swag Bags and Giveaway Baskets. We will have a minimum of 25 Swag Bags which will be handed out at both the front and the back entrances of the VFW for our early shoppers. They will be filled with jewelry, scarves, purses and pouches, vinyl decals, cards, mini monsters, flowers, wood crafted items, and so much more. You'll be drooling over our Giveaway Baskets too! Each is worth at least $150. All you need to have is 3 vendors on the main floor and 3 vendors in the basement stamp your passport and you're entered to win! No purchase necessary - although I'm not sure you'll be able to resist all of the handmade goodness that you'll find that day. Remember that Mother's Day is the following Sunday so be sure to pick up something special for mom! Between now and the market, check back here for sneak peaks of what you might find in your Swag Bag or what might be in the Basket that you win. You may find a work of art from one of our new vendors, Shawn Leer of Prairies Images, in your Swag Bag or Basket. Returning from the fall market is our woodturner, Woodchuckswood. Will you be the lucky receipient of a Fretwork Heart? Like vinyl decals? Twistmo has donated several. How cool are these dragonflies? 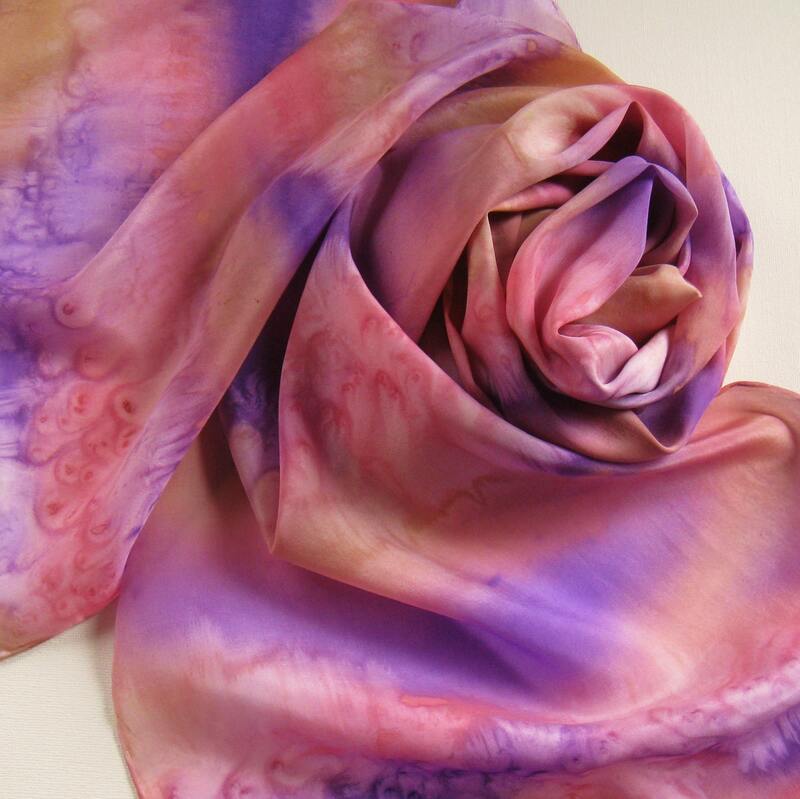 Yvette of boubo makes these lovely infinity scarves. Luann Danzl's flowers will surely brighten up any room at home or at the office! This week's giveaway is from Talia of Eleanore's Treasures. 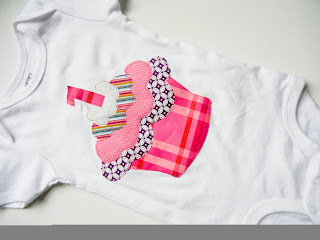 She is giving away this adorable birthday bodysuit or tee. This adorable birthday onesie has a cupcake applique with number “1” to celebrate a 1st year. The applique can also be sewn onto a t-shirt. The final design will be to the winner’s specifications. The applique is designed to fray slightly around the edges with washing. Your baby will be at the peak of fashion chic! Contest ends Saturday, April 14th, at 12:00 noon Central. One winner will be chosen by Random.org. 7. Become a Facebook Fan of Eleanores Treasures. Comment back here with your Facebook name. Existing fans just leave your Facebook name here. 8. Follow Eleanores Treasures on Twitter. Comment back here with your Twitter link. Existing followers just leave your Twitter link here. 9. Follow Talia's blog. Leave a comment here letting us know you are a follower. If you are already a follower, leave a comment anyway, as each comment is an entry.